Does the world have an origin; do species really change? There was a time, when beauty and the nature reigned supreme, supporting each other’s existence in the scheme of things. It was a time of the symbiotic relationship in which love, gratitude and appreciation between the nature and living beings grew and sustained the creation. But things changed, relationships were compromised, the beauty was corrupted and the nature was polluted. The soft, delicate, sensual “The Queen of Garden” – Roses, whose beauty and fragrance was delightful to everyone; but its very soul and essence – its fragrance was synthesized, a cheap mimicry was made and found its way into perfumery. What is in a garden, and exactly what is a plant and how is it different from other life-forms? Today plants are recognized as multicellular organisms that carry out photosynthesis. Plants are eukaryotes—that is, their cells contain a true nucleus and other membrane bound bodies. The rose is one of the most ancient of garden plants and the practice of extracting its oil for use in perfumery and spiritual anointing dates to at least the 9th century BC. The sense of smell is the most basic and universal sense. Even bacteria have mechanisms to detect the presence of chemicals in their environment. The scents that emanate from Rose flowers have been admired by humans since antiquity; a fact that has been documented in ancient texts. 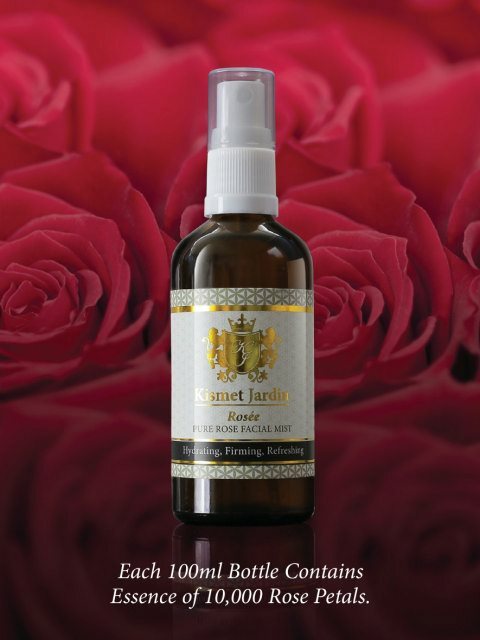 Have you wondered whether you are smelling the pure fragrance of rose in your perfumes and Rose Facial Mists? A rose may be a rose. But that rose-like fragrance in your perfume may be something else entirely, concocted from any number of the fragrance industry’s 3,100 stock chemical ingredients, the blend of which is almost always kept hidden from the consumer(Heather Sarantis, MS, Commonweal; Olga V. Naidenko, PhD, Sean Gray, MS, and Jane Houlihan & Environmental Working Group; and Stacy Malkan, 2010). Perfume formulas are considered trade secrets and all the ingredients that constitute fragrance portion of any product are not necessarily listed on the labels, except 26 commonly known allergens. This heavily misused secrecy is due to a loophole in the packaging & labelling act (Globally Applicable) which explicitly exempts fragrance/perfume. Fragrance is increasingly cited as a trigger in health conditions such as asthma, allergies and migraine headaches. In addition, some fragrance materials have been found to accumulate in adipose tissue and are present in breast milk. Other materials are suspected of being hormone disruptors(Bridges, 2002). Recently the widespread use and demand of Rosewater Facial Spray/Mist to refresh and hydrate the skin, and also its use as gentle moisturizer under the makeup products, caught my attention. All these products, Rosewater Facial Mists and Sprays, I have seen so far, contain two synthetic aroma chemicals that are listed on the labels. These two synthetic aroma chemicals are Citronellol and Geraniol. It is compulsory, due to regulation, to declare these two chemicals on the product labels, because they are known allergens. Citronellol and Gernaiol are synthetically derived from Turpentine Sulfate – a hazardous waste, but have strong odour like roses. Both are listed as alleged fragrance allergens that should be declared in the European Union when used in cosmetics and consumer products. Such allergenic potential is determined largely by effects on the skin once these materials penetrate and elicit an immune response. Other synthetic aroma chemicals used in Rose mists/sprays are Eugenol, Benzyl Benzoate and Linalool. Out of the thousands of synthetic aroma chemicals used by the fragrance industry, there are only 26 ingredients which are required by the law to be listed on the labels. If your product contains 2-5 of these known nastiest ingredients, how pleasant and refreshing, in a real sense, your facial mist or spray is? The health implications of the aroma chemicals are not fully known, as there has been little evaluation of systemic effects. There are environmental concerns as well (Bridges, 2002). For centuries, rose has been the most important source of natural fragrances, and its widespread use in perfumery and in food delicacies, has been considered and reported to be safe. But synthetic ingredients, which are commonly used to mimic the fragrance of rose, have adverse health effects. It is disappointing to see that so-called natural cosmetic companies are using these potentially harmful synthetic aroma chemicals in their products. The pure rose oil has been used in perfumery, flavorings, ointments, and pharmaceuticals including various herbal products for centuries, and has safe history of use. In three different clinical studies it was shown that flowers are a powerful positive emotion inducer. In Study 1, flowers, upon presentation to women, always elicited the Duchenne or true smile. Women who received flowers reported more positive moods. In Study 2, a flower given to men or women in an elevator elicited more positive social behavior than other stimuli. In Study 3, flowers presented to elderly participants (55+ age) elicited positive mood reports and improved episodic memory. Flowers have immediate and long-term effects on emotional reactions, mood, social behaviors and even memory for both males and females (Rosario, Wilson, & Mcguire, 2005). A study was conducted to investigate the effect of rose oil (Rosa damascena Mill, Rosaceae) on human autonomic parameters and emotional responses in healthy subjects after transdermal absorption. Five autonomic parameters, i.e. blood pressure, breathing rate, blood oxygen saturation, pulse rate, and skin temperature, were recorded. Compared to placebo, rose oil caused significant decreases of breathing rate, blood oxygen saturation and systolic blood pressure. At the emotional level, subjects in the rose oil group rated themselves as more calm, more relaxed and less alert than subjects in the control group. These findings represent a relaxing effect of the rose oil, such as causing relief of depression and stress in humans (Hongratanaworakit, 2009). Rose oil helps to restore the chronic stress-induced disruption of the skin barrier. In stressed humans and animals, several brain regions (e.g., hypothalamic paraventricular nucleus [PVN]) exhibit neuronal activation, which increases plasma adrenocorticotropic hormone (ACTH) and glucocorticoids. A study was conducted to assess whether rose essential oil, a relaxing odorant, inhibits the stress-induced skin-barrier disruption in humans. The results suggest that chronic stress-induced disruption of the skin barrier can be limited or prevented by rose essential oil inhalation, possibly through its inhibitory effect on the HPA axis (Fukada, Kano, Miyoshi, Komaki, & Watanabe, 2012). The rose growing and flower processing is a centuries-old industry in Turkey and Bulgaria. Turkey is one of the most important Rose germplasm centers. About 25% of all rose species are native to Turkey. Flowers of some rose species, such as Rosa gallica and Rosa damascena, have been used for rose oil and rose water production in Anatolia for a long time (Ercisli, 2005). A number of historical records point out that the rose-growing in Bulgaria started during the 16th century with production of rose water and rose oil which were widely used within the Ottoman Empire. During the 19th century the industrial cultivation of R. damascena, called also ‘Kazanlashka roza’ (the rose of town of Kazanlak, Bulgaria) spreads throughout the whole Sub-Balkan valley from the town of Sliven to the town of Klisura (Kovacheva, Rusanov, & Atanassov, 2014). Free from synthetic aroma chemicals, each bottle of Rose’e contains extract and oil from 10,000 rose petals. Each 100ml bottle also contains soothing and moisturizing properties of Gotu Kola, Aloe Vera, Marshmallow and Green Tea. Bridges, B. (2002). Fragrance: Emerging health and environmental concerns. Flavour and Fragrance Journal. Ercisli, S. (2005). Rose (Rosa spp.) germplasm resources of Turkey. Genetic Resources and Crop Evolution, 52(6), 787–795. Fukada, M., Kano, E., Miyoshi, M., Komaki, R., & Watanabe, T. (2012). Effect of “rose essential oil” inhalation on stress-induced skin-barrier disruption in rats and humans. Chemical Senses, 37(4), 347–356. Hongratanaworakit, T. (2009). Relaxing effect of rose oil on humans. Natural Product Communications, 4(2), 291–296.